For businesses to survive and thrive in this disruptive data driven economy; it is pertinent for organizations to enhance their market knowledge, improve competitiveness, and transform their operations. Companies that utilize and analyze all of their data will have a significant business advantage and thrive in the Big Data era. However, to profit from big data requires a new approach. Architected in the seventies; legacy data management solutions simply lack the speed and scale required to tackle the velocity, volume, and variety of today’s big data. 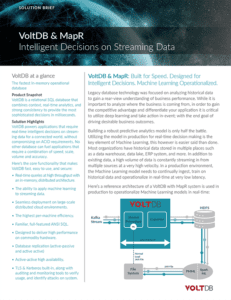 This overview describes how 21st century data management solutions, VoltDB and MapR, can be used together to help enterprises utilize machine learning and take action in-event; with the end goal of driving desirable business outcomes. We’ve also pulled out some information from the solution brief for you to read. Download the full version of the PDF on the right to read the rest. VoltDB provides the ability to ingest data as fast as it arrives; perform real-time analytics in-memory; make automated decisions in real-time; and continuously export, processed data into MapR-FS. VoltDB also supports Kubernetes; enabling continuous and frequent deployment of real-time apps in the public, private, and hybrid clouds. VoltDB’s Kubernetes module enables organizations to automate the deployment of VoltDB clusters, reducing application development timescales down from months to minutes. MapR overcomes the limitations of Hadoop with an underlying data platform that scales to meet any workload with extreme performance. MapR provides a fully read-write file system that brings unprecedented dependability, ease-of-use, and world-record speed to Hadoop, NoSQL, database and streaming applications in one big data platform. The MapR Data Platform provides unique capabilities for management, data protection, and business continuity. Download the Mapr and VoltDB Solution brief.